Rose + gold = instant romantic, glamorous elegance. Yes, it’s that luxurious of a color! 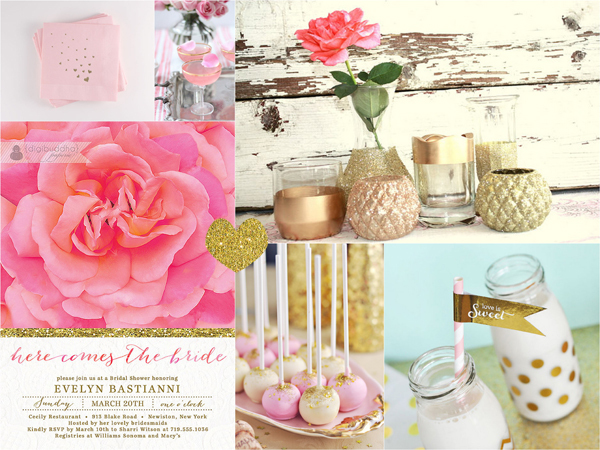 Using this blush pink and glittering gold color palette as inspiration for a bridal shower will have you seeing stars. Check out these pretty little things we think would be perfect for a rose gold-themed celebration. 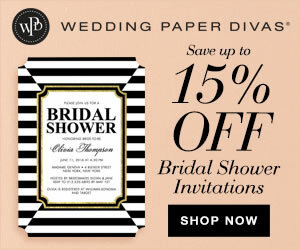 Start the rose gold theme with a pink and gold glitter bridal shower invitation, like this one from Digi Buddha Paperie. Decorate the space with gold-dipped vintage vases and votive candle holders. You can get a set of six from The Paisley Moon. Flutter Heart Napkins in blush with gold foil are the perfect accompaniment to a signature cocktail. Once you have all the ingredients, just shake them together and pour over ice. Garnish with the rose petals. Sweeten the drinks with a girly glam “love is sweet” straw flag. You’ll want to serve a dessert as tasty as it is pretty. How about these pink champagne cake pops?